Today we are talking with Kyla Bennet, an environmentalist and novelist, with a PhD in ecology and a law background. Thanks so much for agreeing to have this interview, Kyla. 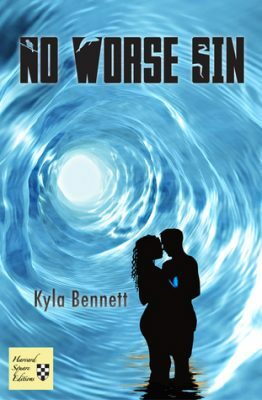 Kyla is the author of No Worse Sin, a YA title coming out on May 15, 2015. Mary: I wanted to start out with your professional career to date. You work for a non-profit and volunteer for a state park. In both these positions you act as a steward for the environment. What are your favorite work experiences, and how did your studies lead to your fiction writing? Kyla: My favorite part about all of the jobs I have had is that they sometimes–although not always–lead to saving a habitat or population of animals. There is something really emotionally satisfying about being able to look at a wild animal or a wilderness place and thinking, “This is going to survive because of the work we did to save it.” It’s giving a voice to the animals and places that could not speak for themselves. I also really enjoy my volunteer work giving nature walks in the state park. A few weeks ago, we took people out at night to look at vernal pools. When we brought a spotted salamander out to show to the group, a 4-year old boy was so wide-eyed with wonder…you could tell that not only was he fascinated with the salamander, but that he cared about it. Being able to teach people about animals and the threats they face is so important. Both of these things–saving animals and their habitats, and teaching people about animals–influenced No Worse Sin. I wanted to write a young adult novel that was romantic and exciting enough to capture teens’ attention and that would also teach them how important the earth and all its inhabitants are. Mary: That sense of wonder in children is so amazing. I’m glad that you got to experience such delight. Is this your first novel? Kyla: Yes, it is my first novel! Mary: No Worse Sin is set in the future, addresses climate change, and involves a romance in the brewing. This mix sounds a little intoxicating, in a good way. One of your main characters is a skeptic when it comes to climate change. I think it’s important to add in such a perspective in order to show how redemption is possible–but I’m just guessing! What can you tell us about your novel so far? Kyla: There is a lot of skepticism in No Worse Sin, some of it valid and some of it invalid. Laena, my female protagonist, believes in climate change, but she has difficulty accepting that it is going happen as quickly and be as devastating as Cree tells her. I understand that it is really hard to be concerned about something that you can’t immediately see. But in the book, I force Laena to open her eyes and believe the evidence in front of her, no matter how disturbing it is. And I’m hoping that this will open the readers’ eyes as well. Mary: Your press release describes part of the focus of the novel as science vs. faith. Can you expand on this? Kyla: I think this aspect of No Worse Sin might become the most contentious part of my book. In my dealings with climate change skeptics, one of the most common arguments I hear is that humans cannot possible change the climate, as only God has the power to do something this drastic. And when I listen to some U.S. Congressmen, I hear the same argument. Believing that humans cannot change the climate, or that a superior force will fix the problems we have wrought, delays implementation of possible solutions. This is very scary to me, and I wanted my readers to understand that we have to act now. So, both Laena and Cree are atheists, two teens who accept science and the frightening fact that humans are changing the climate. They believe we are in grave danger. However, several of Laena’s classmates (and a violent acquaintance of Cree’s) all believe that if climate change is happening, it is God’s will. By doing this, I have pitted science against faith. I am hoping that readers will believe what Cree knows to be fact, and understand that as a species, humans do have the unfortunate power to destroy the planet. If they can understand this, maybe they will force the change that we need. Mary: How did you decide to write for the young adult audience rather than, say, an adult audience? Kyla: Several years ago, my then-teenage daughter was reading the vampire series du jour. She couldn’t put the books down. I decided to read one of them to see why all the kids loved these books so much. When I finished, I thought what a shame it was that this book had captured the hearts of millions of kids’ imaginations, but didn’t make them care about real problems! I wondered if it was possible to write a book that captivated teenagers, but also taught them about environmental issues that would become critical problems in just a few short years–problems they themselves would have to deal with. I think if we’re going to make any headway with huge issues such as climate change, water pollution, and habitat destruction, we must make the children of today understand and care. Mary: I think it’s true that children and teenagers, who will inherit our messes, will have to squarely deal with climate change more than we are–and it’s a sad thought to me. I wondered if you have gotten any early feedback from the young adult crowd about this novel–or other work you have done? Kyla: I have given an advance copy of the book to a lot of my daughter’s friends and to teenage children of my friends. So far, they seem to enjoy the book! And several of the girls have fallen in love with Cree, the male protagonist, which is not surprising. He is pretty cute. Mary: Romance is a good angle for telling the story! How did your work in the field of science prepare or inspire you to pen this novel? Kyla: People always tell you that you should write what you know, and that’s what I tried to do here. No Worse Sin has sub-themes about the endangered right whale getting entangled in fishing lines, pharmaceutical pollution in our waters, and climate change–all problems that I have learned about in my training, and worked on for my jobs! So, my work in science definitely inspired me and helped me write this novel. Mary: I ask this of a lot of authors: who were some of your favorite authors when growing up? Kyla: This is an easy one! I was (and still am) an avid reader. I loved Richard Adams (Watership Down), Madeleine L’Engle (A Wrinkle in Time), all of the Jim Kjelgaard books, William Golding (The Inheritors), and Agatha Christie mysteries. Mary: All great books and authors. Is there anything else you would like to cover here? Kyla: I’m really happy that cli-fi and other eco-fiction is becoming a thing, especially for young adults. As Baba Dioum said, “In the end, we will conserve only what we love. We will love only what we understand. We will understand only what we are taught.” I love the idea of reaching children and young adults through books. I am so grateful to my publisher Harvard Square Editions, which actively seek books with social and political content, especially manuscripts related to climate change and conservation. If we can move our children to care, then there is hope for the future. Mary: Wonderful thoughts to end our interview on, Kyla. Thanks again for this discussion, and I hope your book does well!